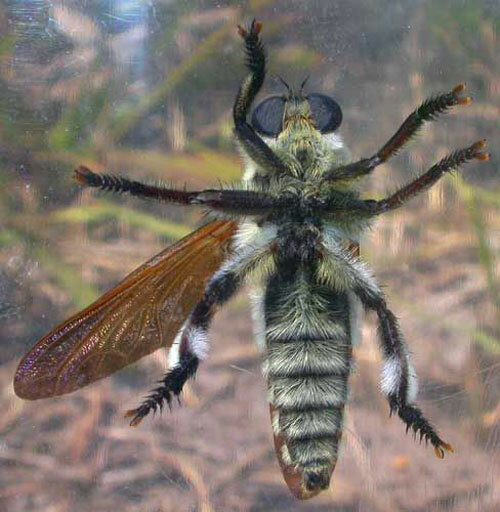 Three large predaceous robber flies of the genus Mallophora occur in Florida (Bromley 1950). Mallophora bomboides (Wiedemann) is known as the "Florida bee killer"
Mallophora orcina (Wiedemann) is known as the "southern bee killer"
Mallophora nigra Williston is known as the "black bee killer"
Two other species are recorded from Florida: Mallophora rex Bromley and Mallophora chrysomela Bromley. Structurally, there is nothing to distinguish them from Mallophora bomboides (Wiedemann), and they are considered to be color variants of the latter. Also, Mallophora nigra Williston may be merely a wholly-black color variant of Mallophora bomboides (Cole and Pritchard 1964). At least 20 species in seven genera of asilid flies in the southeastern United States prey on various Hymenoptera, including honey bees (Apis mellifera L.). Of these, Mallophora orcina is the most prominent, with 80% or more of its diet composed of honey bees (Bromley 1946). Mallophora bomboides occurs in the southeastern United States including North Carolina, South Carolina, Georgia, Florida, Alabama and Mississippi. Flight time in Florida is from April through December, though they are most common in late summer. Figure 1. The "Florida bee killer," Mallophora bomboides (Wiedemann), with honey bee prey. Image taken near Wimauma, Florida. Photograph by Nancy West, University of Florida. Mallophora orcina occurs in the eastern U.S. from Florida north to Ohio and west to Missouri and Arkansas. Flight time in Florida is from April through August, though they are most common in mid-summer. Figure 2. 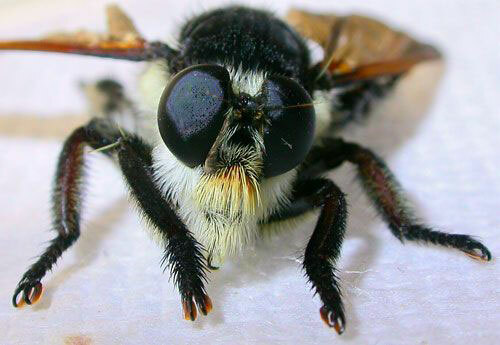 The "southern bee killer," Mallophora orcina Williston. Photograph by Gary Steck, FDACS-DPI. Mallophora nigra is uncommon. It is apparently even more rare outside of Florida, having been recorded only from "N.C." (Cole and Pritchard 1960), presumably North Carolina. Flight time in Florida is from July through September. Members of this genus in Florida are large, robust flies. The wings are smoky brown and the body has dense patches of black and yellow or white hairs. Bee killers resemble bumblebees and carpenter bees in shape and coloration. They generally mimic all of the five bumblebee species occurring in Florida (Stange 1992). They make a beelike hum or buzz when flying (Linsley 1960). Adults typically occur in open habitats, often in the vicinity of apiaries. They perch on stalks of weeds or on tips of shrubs from which they launch their attack (Brower et al. 1960). Prey are primarily social bees and wasps, including honey bees, bumble bees, carpenter bees, Polistes and Vespa wasps. Honey bees may be particularly suitable as prey because of their slow flight, local abundance, and appropriate body size (Poulton 1906). Eggs are laid into the soil. Specific feeding habits of larvae of the species discussed here are unknown, but larvae of other Mallophora species are ectoparasites on scarabaeid beetle grubs in the soil (Knutson 1972). Figure 3. Lateral view of the "black bee killer," Mallophora nigra (Wiedemann). Photograph by Jeff Hollenbeck. Figure 4. 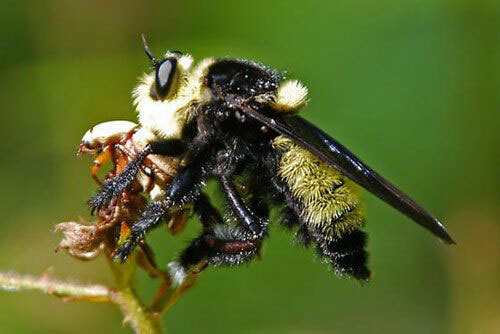 The "southern bee killer," Mallophora orcina Williston. Photograph by Gary Steck, FDACS-DPI. Figure 5. 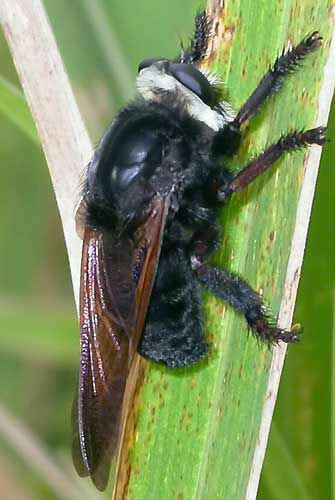 Frontal view of the "Florida bee killer," Mallophora bomboides (Wiedemann). Photograph by Jeff Hollenbeck. Figure 6. 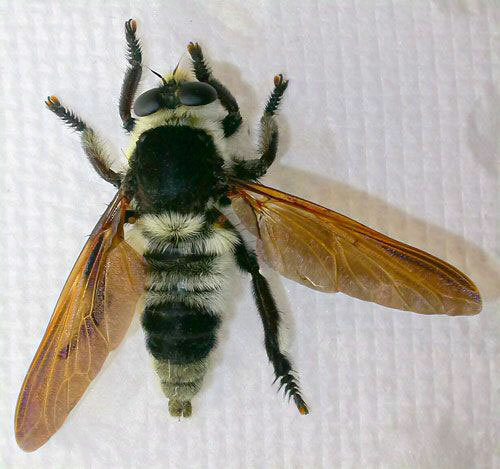 Dorsal view of the "Florida bee killer," Mallophora bomboides (Wiedemann). Photograph by Jeff Hollenbeck. Figure 7. 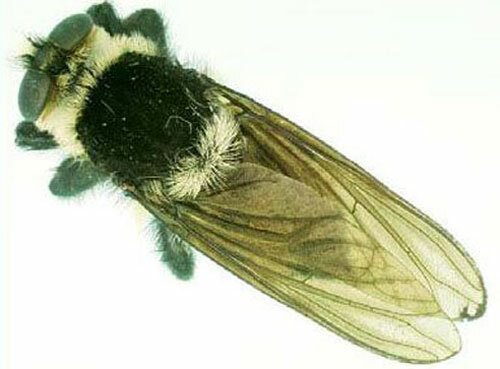 Ventral view of the "Florida bee killer," Mallophora bomboides (Wiedemann). Photograph by Jeff Hollenbeck. Instances of economic losses to beekeepers due to the depredations of asilid bee killers are sporadic, but Florida is one of the few states where such losses have been reported (Bromley 1950). During July 2008, hundreds of these insects were seen attacking bee hives in a watermelon field in Little Lake City, in Gilchrist County, Florida (Halbert 2008). Bromley SW. 1946. Bee-killing Asilidae of the southeastern states (Diptera). Proceedings of the Entomological Society of Washington 48: 16-17. Bromley SW. 1950. Florida Asilidae (Diptera) with description of one new species. Annals of the Entomological Society of America 43: 227-239. Brower LP, Brower JVZ, Westcott PW. 1960. Experimental studies in mimicry. 5. The reactions of toads (Bufo terrestris) to bumblebees (Bombus americanorum) and their robberfly mimics (Mallophora bomboides), with a discussion of aggressive mimicry. The American Naturalist 94: 343-355. Cole FR, Pritchard AE. 1964. The genus Mallophora and related asilid genera in North America (Diptera: Asilidae). University of California Publications in Entomology 36: 43-100. Knutson LV. 1972. Pupa of Neomochtherus angustipennis (Hine), with notes on feeding habits of robber flies and a review of publications on morphology of immature stages (Diptera: Asilidae). Proceedings of the Biological Society of Washington 85: 163-178. Linsley EG. 1960. 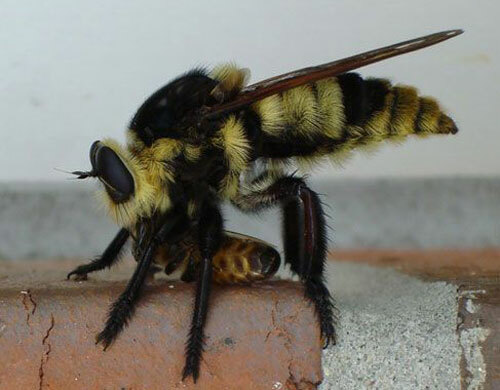 Ethology of some bee- and wasp-killing robber flies of southeastern Arizona and western New Mexico (Diptera: Asilidae). University of California Publications in Entomology 16: 357-381. Poulton EB. 1906. Predacious insects and their prey. Transaction of the Entomological Society of London 1906: 323-409. Stange LA. 1992. The bumble bees of Florida (Hymenoptera: Apidae). Florida Department of Agriculture & Consumer Services, Division of Plant Industry, Gainesville. Entomology Circular 353. 2 pp. Author: Gary J. Steck, Florida Department of Agriculture and Consumer Services, Division of Plant Industry. Originally published as DPI Entomology Circular 366. Publication Date: March 2004. Latest revision: August 2012.